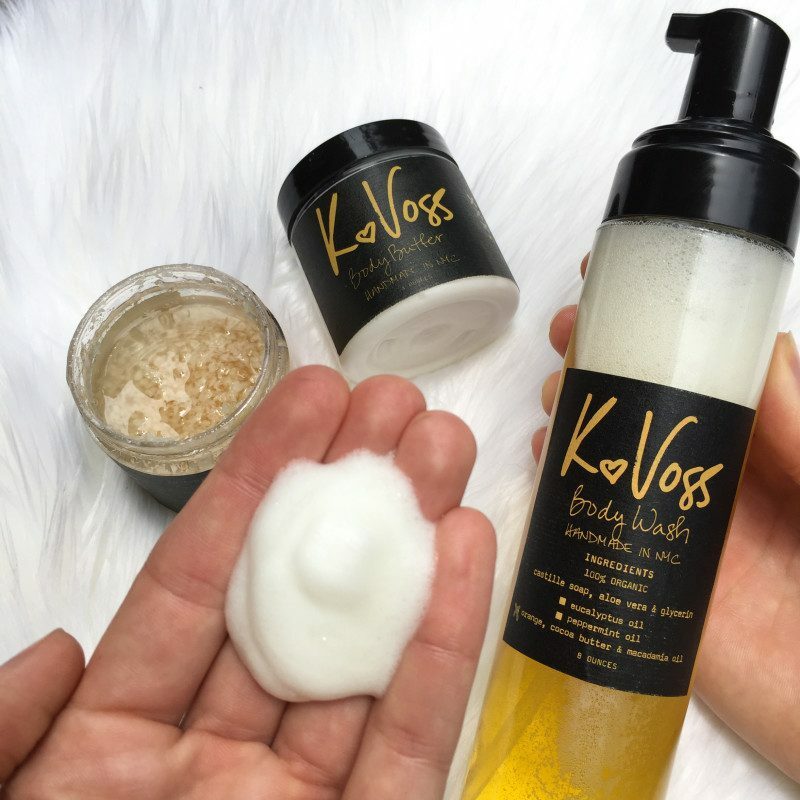 Made from 100% Natural and Organic ingredients like Coconut Oil, Coconut Flakes, Almond Oil, Avocado Butter, Shea Butter and more, if you’re a lover of all things clean and simple this KVossNYC Skincare review is certainly one you won’t want to miss! What first attracted me to this line was, of course, their commitment to clean, green beauty, however, now that I have actually tried out the line, I can honestly say that I am a huge fan of it! There really is nothing better than a simple, clean skincare line, made with only the best, most natural ingredients, that smell amazing and perform flawlessly. Using only 100% Natural and Organic ingredients found in nature. Never using any synthetic colors or scents! 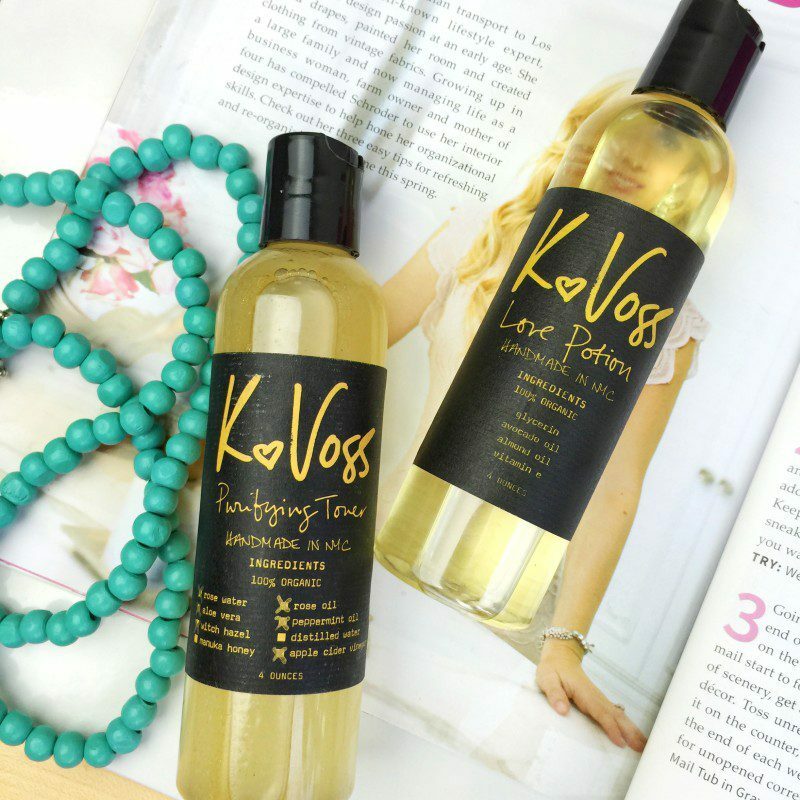 Now that you know how awesome KVoss is, let’s talk about some of my most favorite products! I genuinely enjoyed her entire line so it’s going to be hard to decide which were the best. I have tried my fair share of body butter, but this Ultimate Hydrator has quickly become a new favorite! Made with super moisturizing Cocoa Butter, Shea Butter and Argan Oil this body butter is here to put in some serious work against dry skin and smells so beyond amazing in the process. This butter is pretty thick, but it applies effortlessly, melting into your dry skin and without ever being greasy! My skin just soaks this stuff up and I genuinely love using this. The skin is deeply hydrated by cocoa butter because it is so high in fatty acids. Shea butter is rich in vitamins, minerals, and fatty acids also that rejuvenate and hydrate the skin. Shea butter’s unparalleled moisturizing property is due to several natural moisturizers present in it. These moisturizers are the same as the ones produced by the sebaceous glands in the skin, which produce moisture in our skin naturally. Argan Oil has been reputed to help increase moisture in the skin AND reduce wrinkles by restoring the skin’s hydro-lipid layer. Indulge in the ultimate hydration! Talk about body wash perfection, this Orange & Cocoa Foaming Body Wash is one of the best body washes I have come across thus far. Foaming into the perfect puffs of body wash, this lathers amazing, smells even better, rinses clean and can even be used as a shave gel as well! Made from Castille Soap with Aloe and Olive Oil, Glycerin and Orange & Cocoa Macadamia Nut Oil this wash is heaven in a bottle. Your skin will be left super hydrated and eager for the next wash! Try this one out, I promise you will be obsessed! 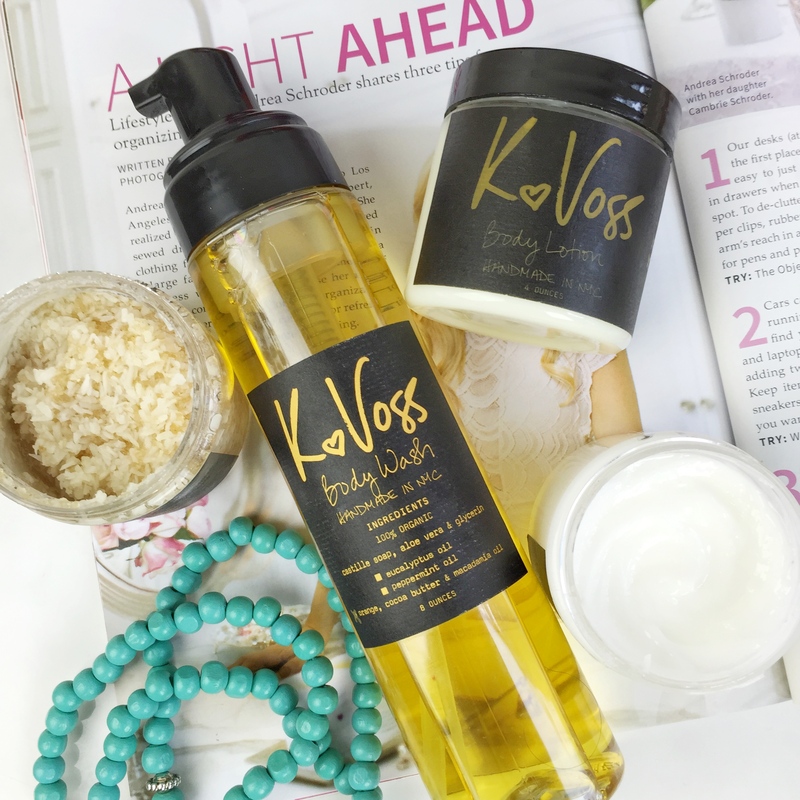 If you want something a bit more lightweight but just as fabulous, the KVoss Body Lotion might be a better option for you! Because this is a lotion, instead of a body butter, it has a more liquid consistency all while being just as hydrating! Designed to reduce cellulite and diminish stretch marks, this lotion works hard to firm and moisturize problematic skin! Because this is a thinner lotion, it’s very easy to apply this to my legs and thighs, in hopes of the anti-cellulite ingredients working their magic heheh. 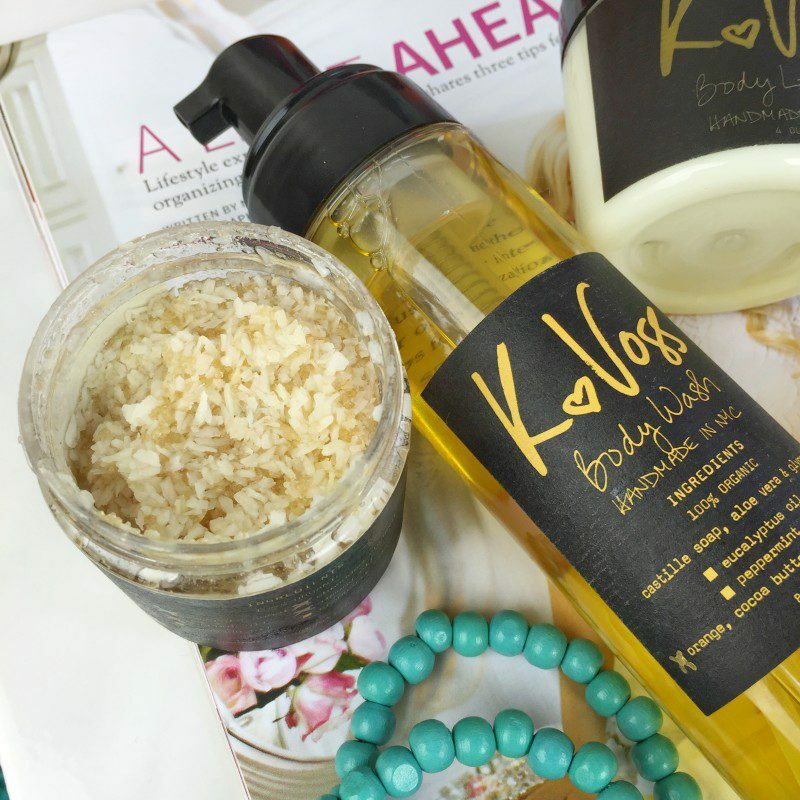 Probably my most favorite item KVoss makes, this Coconut Body Scrub is unlike anything else I have ever tried! Made with actual Coconut Flakes, Almond and Coconut Oils, this scrub smells like the most amazing tropical vacation you’ve ever been on, all while gently exfoliating off dead skin, leaving you with glowing, gorgeous, silky smooth skin. I like to use this product after I shave as it eliminates all dryness and your legs are left softer than ever. Almost a similar texture as the Body Butter, this Face Potion packs a powerful punch! Not only is it made with super hydrating ingredients like Argan Oil and Mango Butter, it also contains Hyaluronic Acid which is an amazing skincare ingredient that hydrates and plumps dry and aging skin. Hyaluronic Acid sounds scary but really, it’s a naturally occurring substance, present in our joints, eyes, and yes skin, but over time, our own supply of it diminishes which is why it helps to apply more! This face lotion smells great, like all of their products do, and it really did feel soothing on my skin. I apply this a few nights a week when my skin is feeling extra dry. The Mango Butter is used for its skin softening, soothing, moisturizing and protective properties and to restore flexibility and reduce degeneration of skin cells. It also has a protective effect against UV radiation and is used for treatment of wrinkles and people who use it will notice decreased signs of aging and the disappearance of lines and wrinkles within four to six weeks of daily use. While this product’s main purpose is a massage oil/ personal lubricant, I happen to use this Love Potion to shave! Made with Glycerin, Avocado Oil, Almond Oil and Vitamin E, this magical potion softens skin so much that it almost erases the possibility of an ingrown hair. Overall, you really can not go wrong with anything you try from this line, everything feels so good on my skin, smells beyond yummy and refreshing, and is so clean, you never have to worry about any bad guys soaking into your skin! I definitely suggest checking this line out for yourself! These sound like great products! I like the sound of their scents too! (thanks for the code!). I purchased the Coconut Scrub and two new items – the Cinnamon Vanilla Scrub and the Macroon lip balm. Thus far, I’ve only gotten the latter two items but they’re both great. The scrub really is amazing. Despite the name, I think it smells like the oatmeal cookie dough my mom used to make. It also leaves your skin slightly scented and so moisturized! Ditto in the lip balm! It just melts into your lips and leaves them so soft. By far the best balm I’ve tried in forever. I truly hope this line gets more love because it’s truly great. So simple, so effective and very well made!